Stop making excuses to not eat your veggies! Sneak them into your day to reap their many health and performance benefits! Vegetables: You either love 'em or hate 'em. Maybe for you, it's the latter. You can muscle through a heavy set of squats, but no way can you get through a few bites of broccoli without wanting to spit it out. Caught at the crossroads between your health and your taste buds, you skimp on these nutrient powerhouses and follow your veggie-free diet. Sometimes your taste changes over time. If you didn't like broccoli when you were 8, maybe you do now. It's never too late to give veggies another try. If you're still not ready for a plate full of savory cabbage and carrots, try one of the following recipes. They can help you boost your nutrient intake by sneaking vegetables into the foods you normally eat! There are a million ways to start your day with vegetables! Maybe you don't want to gobble down a handful of cauliflower as you rush out the door. But what if you tossed a handful of spinach into your morning smoothie? Trust me here: You won't taste these nutrient-packed leaves. They will turn your smoothie an interesting shade of green, but if you can handle squatting heavy weight, you can probably handle a strange-looking drink. This classic lunchtime staple is even better when you throw on a bit of color and crunch. If you build a sandwich correctly (skip the white bread and mayonnaise), the taste of nutty whole grains, meaty protein, and savory cheese can make you forget there's anything vegetable-like inside. In between those slices of tremendous turkey or rock-star roast beef, add some dark leafy greens, maybe some peppers, onions, and freshly sliced tomatoes. The added crunch and burst of vitamins and minerals they provide will further elevate your sandwich game. Eggs are a gold-standard protein that should be the staple of any muscle-building or fat-loss diet. 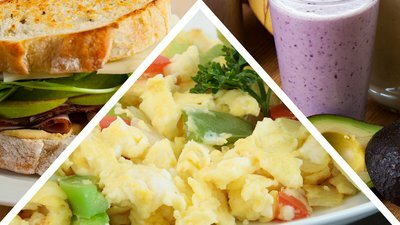 Whether you like them fried, scrambled, sunny-side up, boiled, or omelet-style, eggs provide a good, fast way to get your daily vegetables. Toss veggies into your morning scramble or omelet. Add a sunny-side-up egg or hard-boiled egg slices to your mixed greens or grilled veggies. If you really don't like the taste or texture of vegetables, eggs can help disguise it. You can also flavor your eggs with spices, herbs, ketchup, salsa, hot sauce, or cheese.